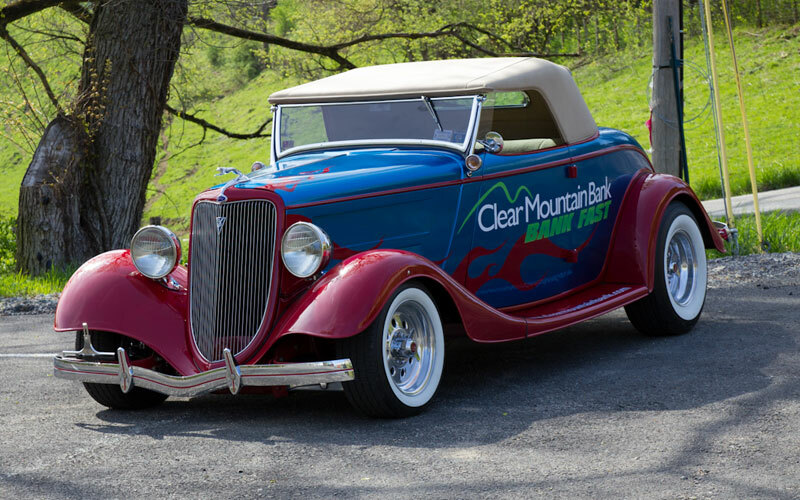 1934 Ford Roadster with a Gibbon fiberglass body, Carson top and custom built frame. 350 cubic inch Corvette engine with a dual Webb intake and carburetors. New Ron Francis wiring, new Auto Meter Gauges, Gennie Shifter, Walker radiator, Vintage heat and AC, luggage rack. 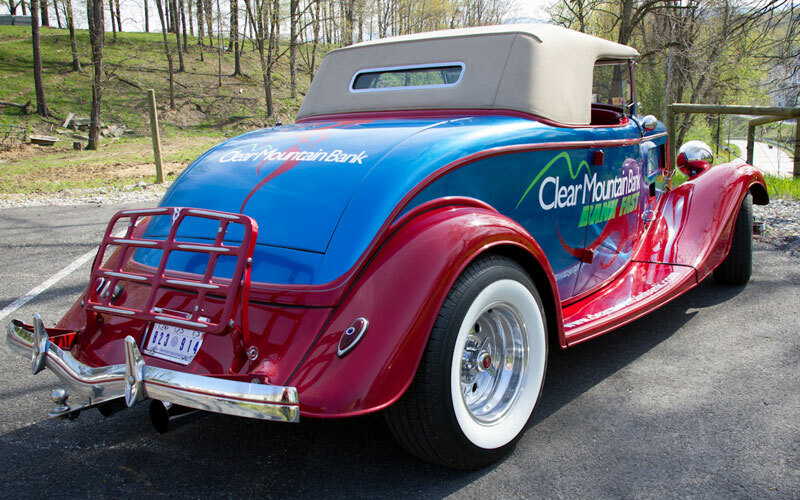 Our BankFast Roadster was named as one of the 20 of The Coolest Branded Vehicles in Banking by The Financial Brand. Click on the link to see what they have to say about its blend of classic and modern design. BANK FAST WITH CLEAR MOUNTAIN BANK. Banking is fast and convenient with Clear Mountain Mobile! View account balances, verify recent transactions, transfer funds, pay bills and even deposit checks from the convenience of your mobile device. Business owners, with Remote Deposit you can deposit checks electronically, right from your desktop! Remote Deposit allows you to scan checks received from customers and issue deposits electronically to Clear Mountain Bank. With SmartLink Online Banking, you can have 24-hour access to account information from the convenience of your personal computer. Check account balances, transfer funds, view account statements, read eStatements, pay bills and much more. Online Bill Pay is the fastest and easiest way to pay bills! Pay virtually anyone, send money to friends and family, receive bills electronically and much more! WANT HER AT YOUR EVENT? Well we aren't going to send our baby home with just anyone. 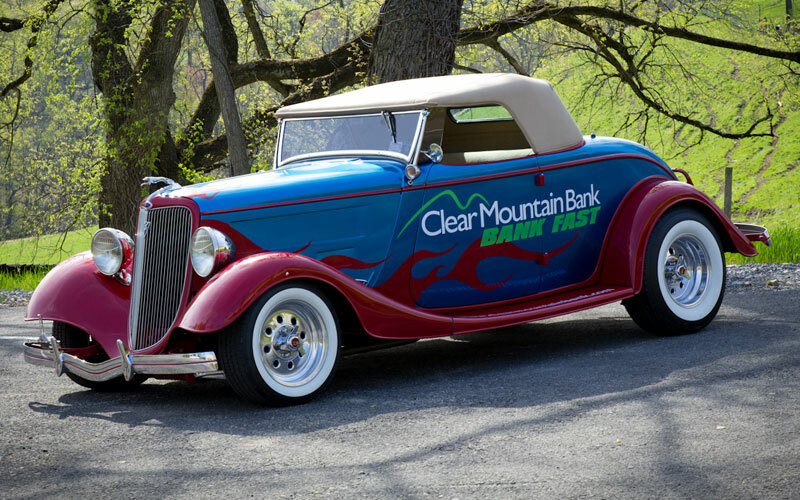 Please provide the information below and a Clear Mountain Bank representative will contact you about the possibility of us bringing the Bank Fast Roadster to your event.